It's finally coming - Minecraft 2.0! Hopefully releasing within the next two months, this 2-years-in-development game will be bringing blocky simulation games to the next level. Whilst based off the original Minecraft engine, this new version completely overhauls major parts of the game and contains many weeks worth of new content and blocks. Currently in closed beta stage, we have secretly been working with a select few members of the community to participate and trial run some specific features from the new version. Neither Mojang nor Minecraft would be where it is today without its community, so we felt it fitting that we let them make the trailer videos and announcements for us, which are visible below. Keralis - Wife vs. Minecraft - Episode 30: Minecraft 2.0! W92Baj - Minecraft 2.0 - You wont believe what has been added - Mindcrack prelease overview. Generikb - Minecraft 2.0 FIRST LOOK! Paul Soares Jr - Minecraft 2.0 - Mindcrack EXCLUSIVE SNEAK PEEK! Pyropuncher - Minecraft 2.0 Footage! AvidyaZen - MINECRAFT 2.0 - THE NDA HAS BEEN LIFTED! Joe Hills - Minecraft 2.0, now with more abominations! Millbee - Preview Of The Minecraft 2.0 Update! AnderZel - Minecraft 2.0 Update Pink Witter? Whilst we aren’t nearly finished with the 2.0 update, we do have a partial changelog of what we’ve done so far. There’s much more to come, this is only the beginning! Known bug: Having both a Pink Wither and a Wither in your world at the same time may cause up to a 200% increase in framerate. Will be fixed for launch. Furnaces have a new “heat” mechanic. Heat needs to be regulated in furnaces or they will blow up. Torches now burn out after a period of time, but may be relit with flint and steel. Added new TNT slab, known as an Etho Slab. Renamed Droppers to floppers, by popular community demand. Droppers were deemed too powerful and go against our original vision of the game. Floppers now turn everything that passes through them into raw fish (see Fishing section). Lapis may now be used for new Lapis furniture. Walking over many blocks will gradually wear them down, creating many new block variants such as Cracked Stone and Muddy Grass. Removed all BUD behaviour, and added safeguards so that it may never come back. Made redstone bugs spawn actual Redstone Bugs to assist with debugging. Added new Quantum Entangled redstone, obtained by mixing 1 redstone, 1 diamond and 3 lapis. One entangled redstone dust will connect to another pair elsewhere. No current way of specifying the connection, may in fact connect to another player’s world. Added new Magic and Luck levels per player. Finding a Rainbow after rain passes will be the primary way of obtaining Magic. Finding a green-tinted horse will be the primary way of obtaining Luck. Added new spell system, costing magic to perform a spell. Spells may backfire, depending on Luck. Turn any item into Fish. Turn current biome into another biome (bug: currently only turns into ocean). Ability to remove gravity from other creatures/players in the world. 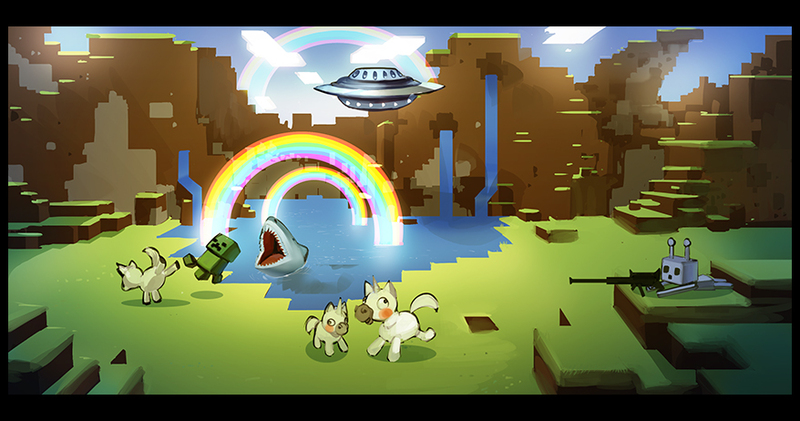 New special types of fish may be found in various different biomes. Fish may become scared if too much noise is made nearby. Added 28 new achievements for fishing. Rare chance for extra items to drop when fishing, such as armor and maps. Having a fish in your possession will drain your health by 1 each second, to help phase out fishing. To deter cheating players on PvP servers, the PvP system has been completely redesigned. Players may no longer attack other players directly, but must recruit an army of Monsters and Animals. Each monster/animal has different strengths, weaknesses and abilities whilst attacking or defending in PvP combat. New turn-based combat system will help create epic battles that may last hours at a time. Added many new mysterious adventuring locations. Going near the farlands will forcefully enable 3d anaglyph. Known bug: Teleporting towards the farlands may send you half way in the opposite direction. Added dozens of new village building templates. Flattened all terrain out slightly, with the exception of the hills biome to make it seem bigger by contrast.